Having a WordPress site is a great way for a business to have an online presence. It is easy for a WordPress site to look ordinary and common. However, that does not need to be the case. Keep reading to find out how to create the best WordPress sites that will attract visitors and keep them coming back. The world is an ever-changing place, and your WordPress pages need to reflect that. Business information can change fast, and a WordPress page needs to continually be updated to provide visitors with the most up-to-date information. Few situations are more frustrating to someone than visiting a website to obtain information only to find that it is outdated and no longer relevant. Making sure the content on your WebPress page is current and includes the most recent information, products, standards, etc. shows respect for potential customers and is simply just good business. WebPress pages should be easy to navigate. Pages that aren’t easily navigable are often a source of frustration to visitors. Often visitors might not return to a web page that is not easy to use. When designing the navigation of your site, it is important to keep your intended audience in mind. The font size should be big enough to be easily seen, and any pull-down menus should be obvious. Another immediately evident feature should be the “contact us” button. A good rule of thumb to keep in mind is that visitors should be able to find whatever they are looking for in three clicks or fewer. The best WebPress sites include responsive design elements. Our culture has become quite mobile-centric, and WebPress pages need to reflect the fact that users will be visiting the site via smartphones and tablets. WebPress pages that are not mobile-friendly will quickly be left in the dust. Often, WebPress signs can fall into a formulaic funk. They are easy to detect because they all have incredibly similar features. So, it is important to make yours stand out. Try adding something unique such as a video, interactive form, or give away something for free. Finding ways to have your WordPress site stand out from the crowd can pay off in spades. Having a “Contact Us” page is fine, but there is so much more you can do. Provide several ways for visitors to connect with you. Include a Call to Action (CTA) on every page, and make it large enough to be easily noticed. Consider making it a different color than everything else on the page so it easily stands out. It is also a good idea to list all of your social networks on the site so people can easily connect with you there as well. Providing a reason for a return visit to the site will practically assure that visitors will keep coming back to your site. If a customer comes back to a site and finds nothing new, it is unlikely they will return another time. But, when there is new and interesting information, they look forward to returning to keep updated. Make the new information noticeable by bringing attention to it. Consider adding a new coupon or special every week or adding a new article or blog post in which visitors will be interested. Most WordPress pages come with a generic footer that includes a theme name, copyright information, and a login. Make your site stand out by customizing it. Use this space as an opportunity to further customize your site. Add your own theme, original copyright text, provide contact information, give a shout-out to your page designer, or anything else that suits your fancy. The personalization opportunities are endless. Anything that is posted on a WordPress page that is not categorized will be placed into an “uncategorized” category, where it could be lost forever. Creating categories that are unique to your site is a great way to have your WordPress page stand out. You will not be able to delete the “uncategorized” option, but make sure you rename it to keep it consistent with your other options. Uniformity is important for a polished look. When a site contains an excessive amount of fonts and the headlines all look different, a site looks messy and unprofessional. The result can be off-putting to visitors, and you risk them not returning the site. Take advantage of the pre-defined settings WordPress provides and use them as a template for designing your site. Don’t underestimate the power of the extra touches that can make a WordPress page really stand out. Include some photos that highlight your message. Use everyday language that visitors can relate to and be sure to use proper grammar and spelling. Repeated usage errors can damage your credibility. It is amazing how an effective WordPress site can help a business. 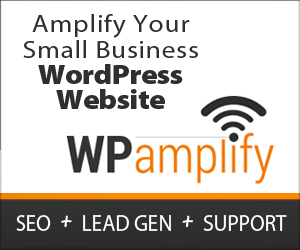 If you are not sure on how to create an effective WordPress site, WPamplify can help you. Our three-step process optimizes your site and helps you generate leads. Contact us today to see how we can help you.